We had our family summer holiday in France this year and although I have plenty of French words stored in my head (thanks to my grammar drilling French teacher Miss Chettle), my pronunciation is terrible. In fact, it’s a bit like watching one of those comedy movies where someone totally out of their depth tries to speak a foreign language and ends up shouting and pointing everywhere. 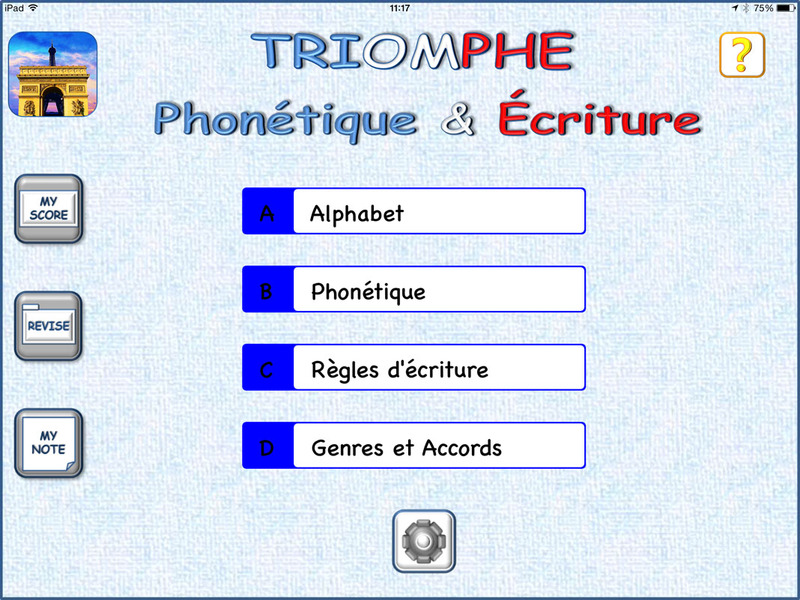 Thankfully for me, Triomphe, a new iPad app aimed at teaching French to school children has been recently released. I’m going to say this right off the bat, but Triomphe is an app that has been carefully thought out and makes full use of the iPad’s interactive features to become more than just a textbook style teaching app. 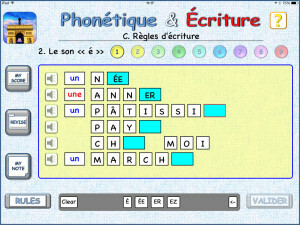 To start with, the app offers you various choices of learning the alphabet or the sounds of words and then couple of sections which have different ‘fill in the words’/grammar exercises. These word fill sections are nothing massively out of the ordinary, they get you to try to select the correct words to make the sentence make sense. 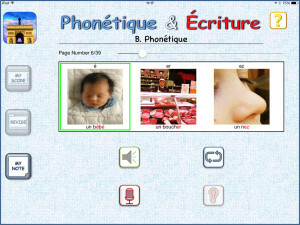 However, what the app does well here is that firstly, there are plenty of sections to do, secondly it self marks and keeps your score and presents scores in a scoreboard system for each activity so you can see where to improve, but most importantly, you can use the speech option to hear a native speaker demonstrate how the sentence should sound so you can pick the right words to use. This is the sort of thing I really like in an app – it uses the iPad’s multimedia facilities properly and in a very well thought out, helpful way. The first two sections of the app though are a highlight for me (mainly because I’m a bit rubbish at French). The first section teaches you the alphabet. 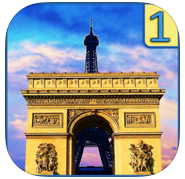 It’s very simple, pick a letter, hear it being said by the French speaker, record your voice saying the letter and play back to compare the two. 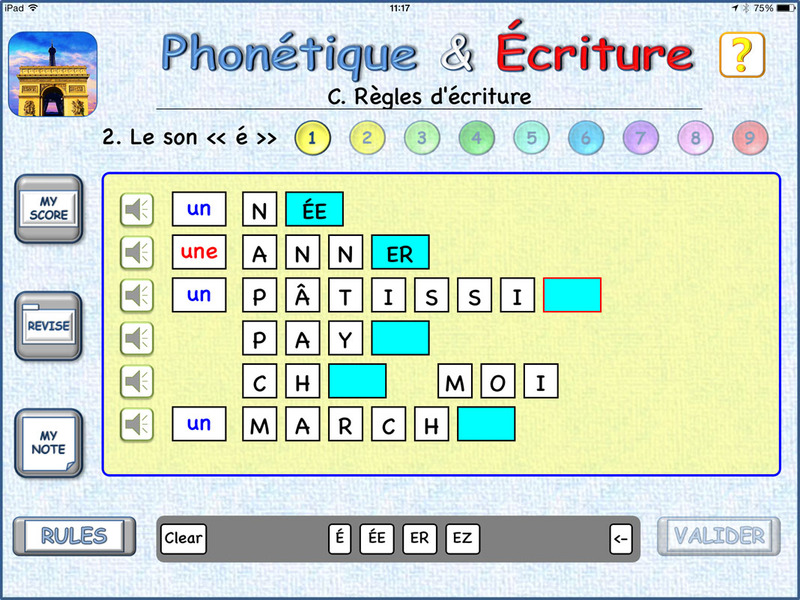 The phonics section offers a similar environment, although this time you get a word, a picture and also the ability to hear the word, record your own voice and compare the two to fine tune your own pronunciation. It is this simplicity which, in a classroom situation makes the app a powerful teaching aid. Navigation is simple in the app, pressing on the app symbol in the top left hand corner of each page will take you back to the menus so you can switch exercises and also there is a notes section if you want to make any in-app notes. Unfortunately, you can’t send them anywhere, unless you manually copy and paste them into another app. This might be a useful feature for the future so you could communicate your notes to the teacher if needed. The only downside to the app is the presentation is a little iOS6 era, using a faux cloth style background and raised button graphics. The inclusion of the Comic Sans font may rile some, but actually (and strangely) this is one of the easiest fonts for children to read. Don’t ask me why, tests have been done on the subject and it always seems to come out on or near the top. In the case of this app, Comic Sans is an appropriate thing to include, even though it might not look the most modern. In all honesty, all of the above is a minor niggle because the heartbeat of the app, which is to teach French grammar is very good indeed. For me, educational apps on the iPad are best when they are simple to use, and use the iPad’s abilities appropriately to make the learning experience better than just using a book. Triomphe does this very well. The real highlight is the voice playback and recording, which you could have done with much fuss and effort in the good old days of the language lab. However, apps like these continue to make the iPad a very powerful learning tool in the classroom. Disclosure: I received a promo code from the developers for this app.